India’s population growth has always been a big headache for policymakers since independence. 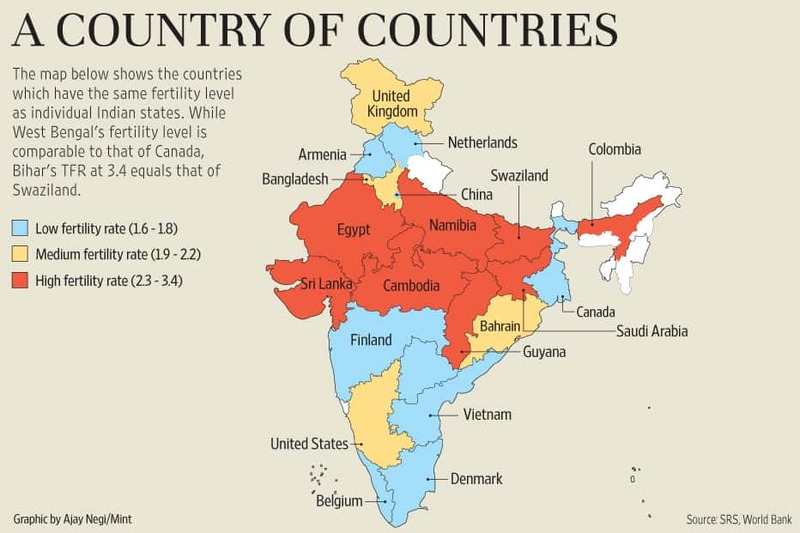 India was the first developing country to declare a policy to reduce fertility in 1952, but the country’s record in tempering population growth lagged behind many others. However, fresh demographic data published by the Census office earlier this week shows India has made rapid strides in reducing fertility levels over the past decade and, if current trends continue, India’s population is likely to stabilize in the next couple of decades. The latest Sample Registration System (SRS) statistical report shows India’s total fertility rate (TFR) has fallen 0.3 point over the past five years to 2.3 in 2013. Over the past decade, it has fallen by roughly 0.6 point. TFR is a summary measure of fertility that indicates the average number of children a woman of child-bearing age is likely to have in a particular period of time. Assuming zero mortality in women of child-bearing group, a TFR of 2 would denote that population in a society has stabilized. In most advanced and middle-income economies, a TFR of 2.1 is typically considered to be the replacement level. When the TFR reaches the replacement level, the country moves into the final phases of demographic transition, in which population first stabilizes, and then falls as TFR falls below the replacement level. If the pace of decline in fertility over the past few years continues over the next half a decade, India’s TFR will have reached the replacement level. While the steady decline in TFR is indeed a welcome sign of India’s development, there are sharp variations in TFR levels across states. As many as 11 states—West Bengal, Delhi, Himachal Pradesh, Punjab, Tamil Nadu, Andhra Pradesh, Kerala, Maharashtra, Jammu and Kashmir, Karnataka and Odisha—have already attained the replacement level TFR of 2.1. But nine still have above-replacement TFR. In eight of these, TFR is either higher or equal to the national average, and it is these states that are propelling India’s population growth. The low-fertility states have already attained the TFR levels of developed countries, while the high-fertility states have TFR levels comparable with those of the poorest African nations. West Bengal’s TFR (1.6) roughly equals that of Canada, and Tamil Nadu’s TFR (1.7) equals that of Denmark. Uttar Pradesh, with a TFR of 3.1, is comparable with Namibia, and Bihar with a TFR of 3.4 is comparable with Swaziland. Uttar Pradesh and Bihar already account for one-fourth of India’s population, and will continue to account for much of population growth in the coming decades. At the same time, the low-fertility states will see their population share declining. These changes can have profound consequences on migration patterns and reshape politics in the country (see Mint’s analysis). States with large and growing rural population are likely to have different policy priorities than states with smaller and more urbanized population. Similarly, the priorities of states with ageing and shrinking population could be very different from states with younger and growing population. Resolving such contradictions could become a key challenge for India’s polity in the coming years. Like in other parts of the world, income differences play a role in driving fertility differences. High-fertility states in India are, on average, poorer than low-fertility states. Yet, female autonomy could be playing a bigger role in driving fertility differences in India. A simple correlation analysis shows that female literacy rates have the greatest bearing on TFR levels across states, followed by per capita income and urbanization. The correlation of each of these parameters with TFR is negative, indicating that higher female literacy, income growth and expansion in urbanization are all associated with declining TFR. Almost all high-fertility states are either low-income ones or fare poorly in female literacy, or have a large rural population. The converse holds true for low-fertility states. There are only two major exceptions, situated in two extreme ends of the country: Gujarat and Odisha. Gujarat is a high-income urbanized state with above-average rates of female literacy. Yet, its TFR is above the replacement level. Odisha is a low-income state with a large rural population. Its female literacy rate is marginally below the national average. Yet, Odisha’s fertility levels are much below the national average, and it has attained the replacement level TFR of 2.1. 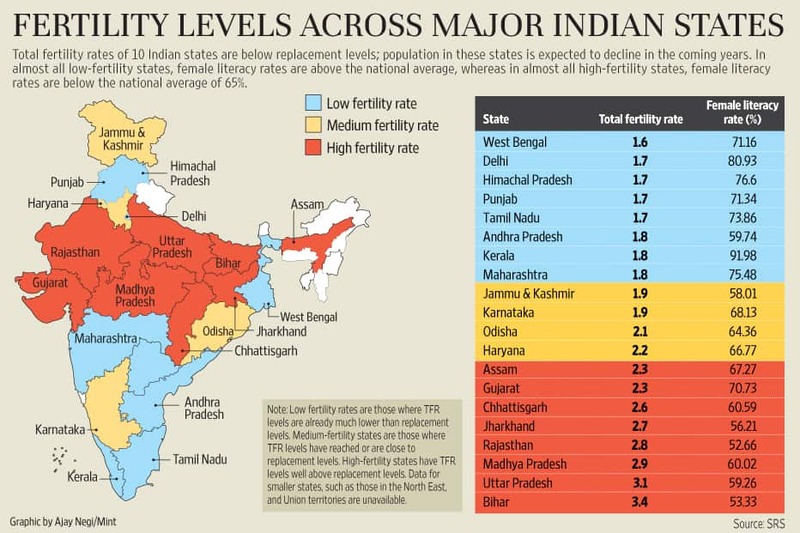 All four states in southern India are low-fertility states and have already attained the replacement level TFR. India’s high-fertility zone is largely composed of the so-called Bimaru states—Bihar, Madhya Pradesh, Rajasthan and Uttar Pradesh. These have been developmental laggards for a long time now, and are likely to lag behind the rest of the country in stabilizing their population.